Balmoral Group chairman Jim Milne says the business community feels pressuised into supporting Sir Ian Wood's vision for Union Terrace Gardens. One of Aberdeen's leading businessmen has spoken out against plans backed by Sir Ian Wood to radically transform the city centre. Jim Milne, Chairman of the Balmoral Group, says he thinks some people feel pressurised into supporting the project purely as a result of Sir Ian's status. The Wood Group boss has pledged £50million pounds to raise the Union Terrace Gardens to street level to create a civic square. Mr Milne says he does not think the scheme has the backing of the public. He said: “I think there’s a lot of people feel that they should support it because Sir Ian came up with the idea. But it shouldn’t be what Sir Ian thinks – it’s what Aberdeen wants and the feedback I get from many business people and the public is they don’t want it. I’d say 60, 70, 80% of the people I’ve spoken to don’t want it. 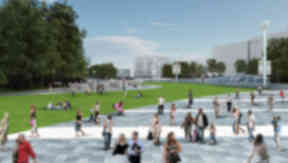 Mr Milne added that he felt the Aberdeen City and Shire Economic Future (ACSEF)-backed civic square concept has seen Peacock Visual Arts’ plans to build an arts centre in the gardens unfairly thrown into jeopardy. He said: “After Peacock getting their acceptance from the town planning, they were well on their way to starting their building and then, bang! This thing (civic square) comes in and blows it right out of the water. “I think that was totally unfair and quite frankly I think Peacock’s design was far more acceptable for Union Terrace Gardens than covering the whole thing with concrete. Mr Milne also hit out at business leaders in the city who “scaremonger” about Aberdeen’s future post-North Sea oil. He said: “This doomsday that Sir Ian and others are predicting for Aberdeen in ten or 15 years, I think is absolute and total rubbish. “This scaremongering, saying Aberdeen will become a ghost town – that really upset me because I’m a passionate Aberdonian and I love my city. And I certainly won’t move out of this city. In a statement ACSEF said Mr Milne’s claims were “unfounded”. Chairman of ACSEF, Tom Smith said: “Through the consultation and all our presentations we have sought to inform people of the facts so that they can make an informed decision. Such a transformational project requires public support and we want to ensure that everyone – from all walks of life, not just business, gets a chance to make their views – for or against. Elly Rothnie of Peacock Visual Arts said: "As I understand it, Jim has huge amounts of respect for Sir Ian Wood and we all understand his aims in making the city better and more vibrant. However we're still being inundated from members of the arts community as well as members of the business community as well as the wider population of Aberdeen who're worried that this project is being looked at in isolation when we should be looking at the wider context for Aberdeen." The Sir Ian Wood-backed plan for a five-acre city square connecting Union Street, Union Terrace, Schoolhill and Belmont Street is currently the subject of a public consultation led by Aberdeen City and Shire Economic Future (ACSEF).